Jean Todt is a French motor sport executive, and currently the President of the Federation Internationale de l’Automobile (FIA). Previously, Todt was CEO of Ferrari Motorsports and began his career as a rally driver with the Peugeot Talbot Sport team. 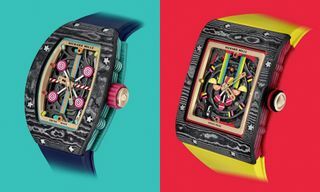 Richard Mille has created this limited edition timepiece in his honor. 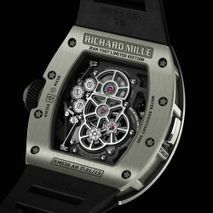 This new Richard Mille Capteur de G Tourbillon Jean Todt features a 50mm x 42.7mm x 16mm titanium case, double sapphire crystals and is water resistant to 50 meters. 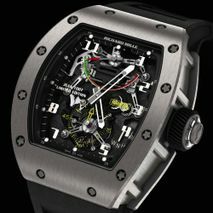 Movement is the Swiss manual-wind Richard Mille in-house caliber RM036, with tourbillon complication and G force indicator. The watch has 26 jewels, beats at 21,600 vph and has a power reserve of 70 hours. 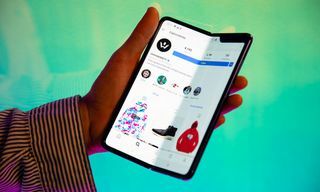 It features a Glucydur balance, a Nivarox Elinvar spiral and a Kif Elastor anti-shock device. The dial is made of nanofiber carbon particles, hand skeletonized.